Presented here is a selection of photographs from the H. Ambrose Kiehl Photograph Collection taken between 1890 and 1917. The photographs are typical of those found in many family albums of that period and illustrate everyday family life at the turn of the century. Many of the photographs, taken by Mr. Kiehl himself, are candid and delightful shots of family gatherings. They include the pastimes and childhood adventures of the Kiehl children, Laura and Miriam, who were born in the early half of the 1890s. They also trace the Kiehl family history as the family moves from Port Townsend to Seattle and reflect Mr. Kiehl’s activities as a civil engineer working in various capacities in Washington State and Alaska. A large portion of the collection shows the construction in the late 1890s of the new Army Post on Magnolia Bluff for which Mr. Kiehl was engaged by the U.S. Army to serve as the Civil Engineer. 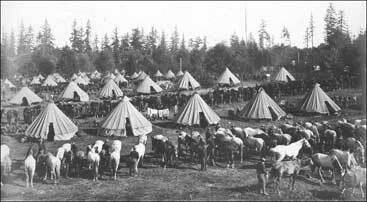 The site was then a wilderness area on the outskirts of Seattle, and many of the photographs show land clearing and building activities that reflect the development of Fort Lawton. This area subsequently became known as Discovery Park. Kiehl was perhaps more prolific than most early day photo enthusiasts. His collection contains some 1000 images most of which he processed himself. Many were taken using the newly-introduced Eastman flexible roll film, although he also used the same gelatin dry plates (glass) that he used to more seriously record the engineering projects he was engaged in. Fortunately for us, he kept a detailed photo notebook in which he meticulously recorded the subject, the location and the date of each of some 950 of the photographs he took. Mr. Kiehl was born in Dayton, Ohio in 1865. He received his training as a civil engineer at Ohio State University in the 1880s. After graduating he "went west", first to San Francisco and then to Puget Sound, where he opened an engineering office (Kiehl & Hogg) in Port Townsend, Washington Territory. Port Townsend probably appealed to him because, at that time, it held the promise of becoming one of the major cities on the Sound. In Port Townsend, Kiehl met and married Louisa Jean Stockand, whose parents had emigrated from the Shetland Islands in 1857 and taken out a Donation Claim in the Chimacum Valley, where they farmed. They later established a residence in Port Townsend. 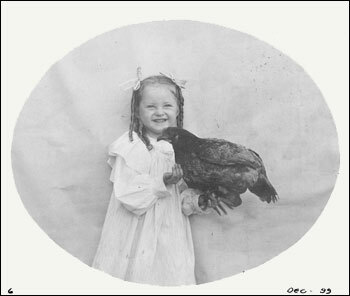 The first of the two Kiehl children, Laura Adele Kiehl, was born in Port Townsend in 1892. The second, Lorena Miriam Kiehl, was born in Seattle in 1895. In the mid 1890s, Kiehl closed his office in Port Townsend. The city had lost its position as the primary port of entry to the Sound and with it its potentially promising future. The great depression of 1893 was also a compelling factor. Kiehl sought opportunities elsewhere and in 1895 found employment with the U.S. Army in Seattle. A decision had been made as part of a plan for national defense to construct a military post on Magnolia Bluff near Seattle. The Quartermaster General of the Army sent W.W. Robinson Jr. to Seattle to serve as the Constructing Quartermaster to work with the city in assembling the land and start the process of constructing the post. One of his first moves was to employ H. Ambrose Kiehl, Engineer, to survey the land, supervise clearing and grading, lay out road and building locations and, with Captain Robinson, supervise construction of the new post, later to be named Fort Lawton. The first building to be built was a temporary office and residence for the engineer. The Kiehls, not so fondly, called it "the shack." They lived there for only two or three years until the first Officers Quarters (Bldg. 678) was completed in 1899. Even though a civilian, Kiehl was able to move his family into the new Quarters until it was needed by the Army. This was grand living for the Kiehls. Even though lighted by kerosene lamps, it actually had a bathroom, running water, a kitchen and central heating. Kiehl also started building a new house at 421 West Galer Street that became the family home in 1905. 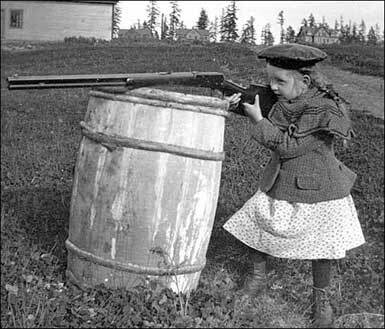 Laura, the youngest of the Kiehl children, lived on the grounds and watched the new Army Post grow and become Fort Lawton. She also lived near-by most of her adult life and saw it through two world wars and a varied history of some 80 years and become Discovery Park. In addition to his work at Fort Lawton, Kiehl had assignments at Fort Worden, Flagler and Casey at Admiralty Inlet, Forts Columbia, Canby and Stevens at the mouth of the Columbia River, and at Fort William Henry Seward near Haines, Alaska. All of these Forts were under construction or being expanded at about the same time under the same-plan for national defense. Besides to his continuing interest in photography, Kiehl had a life-long interest in music. He played the organ and led the choir in the churches the family attended in both Port Townsend and Seattle. Mrs. Kiehl (Louisa) died of cancer in 1917. In the early 1920s Mr. Kiehl was transferred to Fort D.A. Russell near Cheyenne, Wyoming, and in 1927 to Fort Frances E. Warren, where he continued to carry out engineering assignments for the Army. After his move to Wyoming, he started a new series of photographs, which he recorded in a new photo notebook. His last entry in that book (No. 333) was made in 1937. There may be a gap in the record at this point, however notes left by his daughter Laura indicate that Mr. Kiehl died in September, 1942. The first indication that the Kiehls might be a source of early photographs came in 1972. Mrs. Frederick Mann was, at that time, voluntarily searching photo records of museums, libraries and newspapers for early glimpses of the land that was to become Discovery Park. During her search she came across the December 9, 1942 edition of the "Seattle Album" in the Seattle Post Intelligencer. 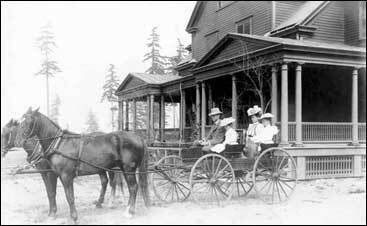 It featured a picture the Kiehl family in 1901, seated in a buggy in front of the first Officers Quarters completed at Fort Lawton. Mr. H. Ambrose Kiehl was holding the reins and one of the two children in the buggy was Laura Kiehl who, it was said, furnished the photograph. The name H. Ambrose Kiehl, CE QM Corps was also found on the earliest drawings in Army files that were being reviewed by the Park Department in the land transfer process. A brief search indicated that there were no Kiehl relatives remaining in Seattle. Photographic collections so often become scattered and lost after a generation or two. It was undoubtedly the forethought and care of Mrs. Helen Gunn of Port Townsend that saved the Kiehl collection from such a fate. Mrs. Gunn took the trouble in 1976 to write a letter to then Mayor Wes Ulhman saying that she had read that Ft. Lawton might become a city park and that a very elderly lady, Ms. Laura Kiehl, was living with her. She also relayed that Ms. Kiehl had much information and many photographs taken by her father that might be of interest to the city. Mrs. Gunn is also due much gratitude for her assistance in pulling together the already scattered collection. By that time, Laura Kiehl was confined to a wheel chair and was too weak to rummage through basements and attics to find her father’s records and plate negatives. Mr. and Mrs. Mann visited Laura many times, as did many others who became intrigued with her sharp recollections of the Kiehl-Stockland story right back to the beginning of settlement on Puget Sound. Laura Kiehl visited her childhood haunts at Fort Lawton -Discovery Park with the Manns at one point and in time provided most of the Kiehl lore included in this archive. Laura's own story is of interest. She graduated from the University of Washington in 1916 with the intention of becoming a stock broker. She may have been Seattle's first female stock broker, because as she said, "-none of the male-dominated brokerage firms in Seattle would have anything to do with a woman, so I opened my own office — in the Smith Tower." She was proud to report that, "I got all my clients out of the stock market before the crash of 1929". Laura never married and continued to live at the family home on Galer Street, where she supported her somewhat incapacitated sister Miriam until Miriam died in the 1960s. Laura stayed on well into her 80s. She sold the family house in 1975 and moved to Port Townsend to live with friends. Laura died in Port Townsend in 1982 at 90 years of age. Before she died, Laura very generously loaned her father's collection to the Manns with the understanding that it would be made available to the public at Discovery Park for enjoyment and study. She was also very pleased, and in full agreement with the plan that after suitable duplication for Park purposes, the original collection would be placed in the Special Collections Division of the University of Washington Libraries where it would also be available for public study. The information for the H. Ambrose Kiehl Collection was researched and prepared by the UW Libraries Special Collections and Cataloging staff in 2009. Only selected photographs were included in this database. The images were scanned in grayscale using Microtek scanners and saved in .jpg format. Some manipulation of the images was done to present the clearest possible digital image. The scanned images were then linked with descriptive data using the UW Contentdm program. The original collection resides in the UW Libraries Special Collections Division as the H. Ambrose Kiehl Collection PH Coll 574.